The Lamborghini Huracán is something of an idiot-friendly supercar, with safe, steady handling and all-wheel drive. A new and more wreck-prone version may be in the works. You see, the Huracán is altogether too difficult to crash for rich people with more money than skill. It seems like Lamborghini is finally stepping up with a higher spec edition of their base model. You know, something more likely to send morons with money into a tree. This would be the Super Veloce, as CarScoops reports. You can see their picture right here. 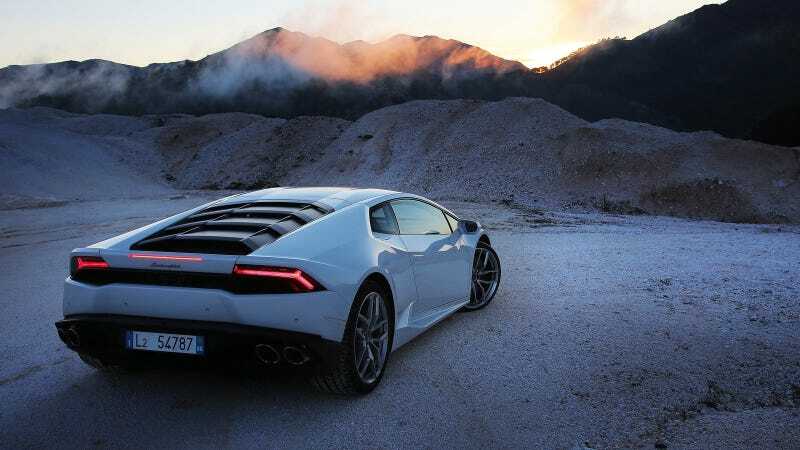 It’s not hard to figure that Lambo will do some sort of added performance model treatment with the Huracán, just as they did with the Gallardo before it. That CarScoops spotted what looks like a modified version of the Huracán driving around supports the theory. Hopefully this will finally be a Huracán for people who enjoy the thrill of near-death behind the wheel.